Computer-generated visual effects are now used extensively in feature films, commercials, music videos, and multimedia. 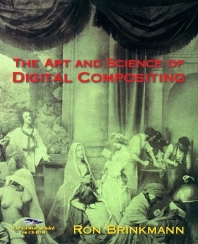 The backbone of this process, the final and most important step, is known as digital compositing. The Art and Science of Digital Compositing is a comprehensive reference that provides a complete overview of the technical and the artistic nature of this process. This book covers a wide range of topics from basic image creation, representation, and manipulation, to a look at the visual cues that are necessary to create a believable composite. Designed as both an introduction to the field as well as a valuable technical reference, this book should be of interest to both novices and professionals alike. Written by a working professional in the visual effects industry, the book provides over 250 different images and illustrations (including a 40-page color insert) as well as a complete glossary of compositing and visual-effects terminology. Also included are in-depth case studies from well-known films such as Speed, Independence Day, and Titanic. Ron M. Brinkmann has been working in the field of Computer Graphics for over a decade, involved with both hardware and software design, development and use. His primary field of expertise is in visual effects for feature films, and his personal feature-film credits include: Contact, The Ghost and the Darkness, James and the Giant Peach, Die Hard with a Vengeance, Speed, Hideaway, Tall Tale, Last Action Hero, and In the Line of Fire. He has had articles published in a number of magazines, and has lectured on the topics of digital compositing and visual effects in the U.S., Europe, Australia and China.